What are the names of the buildings Schulhof Promenade? What can you find in the Pedestrian street? How many people can get in to the Blue church? The Heart of Jesus church why is called as “Fradi church”? When was the foundation stone of the City Hall settled? How many times was the Church from the Arpadian age restored? Church from the Arpadian age Calvinist Church? What kind of exhibitions can be found in the Museal collection? What can you buy at the local Market? What memories can you find in the Museum of Egregy? What symbolize the Flavius wish ribbons? What do you have to know about the legendary cherubs? Here you can find all the answers! There are several artworks in the public places of the town; you can see a statue or sculpture nearly in every street, most of them were created by the famous sculptor, László Marton. In the park of the Lake Spa, known as Hévíz Statue Park, there is a group of statues including the busts of three outstanding figures of Hungarian literature: bust of Zsigmond Móricz (created by László Kutas), Mihály Csokonai Vitéz ( by József Rátonyi) and Dániel Berzsenyi (by Tibor Riger). You can see 13 memorial tablets placed on the wall of the Winter Spa to commemorate the most famous visitors of the Spa. The Promenade is part of the park, located around the thermal lake. The Dr. Schulhof Vilmos Promenade is starting from the “Indoor bath” („télifürdő”) building, located at the end of the pedestrian zone and it leads to the main entrance of the thermal lake. Hévíz Lake is situated on one side of the Promenade, which is shaded by sycamore trees and bordered by benches, while on the other side we can find the historical buildings of Szent András Reumakórház (Saint Andrew’s Hospital for Rheumatic Diseases). These buildings were built in the 1870s and they were transformed into the current two-storey structures in the beginning of the 1900s. Each house got its own history. The Art Nouveau style building is located at the northern part of the „Újtelep”, an area established by the Festetics Family. It was named after György Festetics, founder of the town of spas. Currently the György House is accommodating the “A” Building of Szent András Reumakórház (Saint Andrew Rheumatologic Hospital). It was named after Ferenc Rákóczi the Second, as the building was built in 1863 and the ashes of Ferenc Rákóczi were brought back from Turkey to Hungary in the same year. Currently the Rákóczi House is accommodating the “B” Building of Szent András Reumakórház (Saint Andrew Rheumatologic Hospital). The building was named after Ella Karola, who was the daughter of Tasziló Festetics. Currently it is accommodating the “C” building of Szent András Reumakórház (Saint Andrew Rheumatologic Hospital). If we carry on towards south, the next building is a restaurant and assembly hall. The border of the Festetics Estate stretched to this building; this was the first house built from stone. It was built at the end of the 1860s for accommodating guests of the thermal bath. An additional storey was added to the building in 1909, and it became a “Cure Saloon” („Kúrszalon”), which at the time was necessary at bathing resorts. Currently the assembly hall of Szent András Reumakórház (Saint Andrew Rheumatologic Hospital) can be found here. Francis Joseph – the King of Hungary and Austrian Emperor- made Festetics (II.) Tasziló into prince in the year of the building’s handover, who was the builder of the building. Therefore the choice of name for the building. Currently the Francis Joseph House is accommodating the “D” Building of Szent András Reumakórház (Saint Andrew Rheumatologic Hospital). The building was built based on the plans of Ferenc Lonkay, the manorial architect of the Festetics Family in 1870-71. The house was part of the “Újtelep”, where the houses were serial numbered. Therefore the choice of name for the building. Currently a hotel is operated in the building under the management of Hévíz Medicinal Spa and Saint Andrew Hospital for Rheumatic Diseases. The original name of the building was Tasziló villa, but after the death of Prince Festetics (II.) Tasziló it was renamed to Deák House after Ferenc Deák. Look around in our 3D tour! The entire length of Rákóczi Street is a pedestrian zone. This street connects Széchenyi Street (which is the main street) with Dr. Schulhof Vilmos Promenade. The Tourinform Office is located at the beginning of Rákóczi Street. If you are coming from Széchenyi Street you will find the Office is on your right. The tourist information office is open all year round and offers programs in the area and tourist information for the visitors. The office also provides internet facilities and bicycle rental services. If you carry on down Rákóczi Street towards the thermal bath it is worth looking at the buildings hiding behind the trees among boutiques, cafeterias and ice cream parlours. 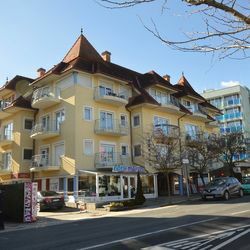 The pedestrian zone is bordered by villas built in the 1920s, which are nowadays - after significant restoration works- accommodate apartments and cafeterias. Fontana Motion Picture Theatre (Fontana Filmszínház) is located half way down Rákóczi Street and opposite the id. Dr. Moll Károly Square with a fountain and the full size bronze statue of Károly Moll. Károly Moll is the „father” of weight bath, which he developed in Hévíz in the 1950s. The building of the Indoor bath is situated at the end of the street. The Therapeutic Centre (Terápiás Centrum) was handed over in 1968, which is nick-named by the locals as the winter bath. It was reconstructed in 2004 and there are plans to extend and further develop the building in the near future. We can view the Pantheon on the external wall of the building, and in the foyer the Jupiter stone is exhibited, which proves that people were living in this area already 2000 years ago. The new building of the city-hall is located at the Kossuth Lajos street, it was constructed between 1998 and 1999 on the place of the former town-house. It was inaugurated on September 9th, 1999. The building is one of the important eyemarks of Heviz; it was built in 1950, and in 1997 the renovation was started behind the former town-hall. On January 31st, 1998 Bertalan Farkas, the first astronaut of Hungary and the mayor laid the foundation stone. The plans were prepared by Laszlo Benczur and Peter Takacs, under the co-ordination of Peter Reinholz Kossuth Prize-winning architect. The Building-trade Company of Zala county was implementing it. The useful floor-space of the building is 3367 m2. The office of the local government is located in the building, its employees receive the clients every working day. The southern side wing includes a conference and theatre hall for 200 persons, this facility serves not only the meetings of the city, but all other scientific and cultural events. The Egregy part of the town called Hévíz used to be a medieval village, which has been destroyed during the Turkish occupation and has been rebuilt by German settlers in the 17th century. The traditions of vine-growing are preserved by the local oenologists and inns. One of the pearls of the town, the ancient monument church built in the 13th century is located in the Egregy part of the town. The church is surrounded by a graveyard. From the top of the hills there is a wonderful view to see. The exact date of the construction of the church is unknown; presumably it was built in the middle of the 13th century. Written records mention it for the first time in 1341. The building was heavily damaged during the 16-17th century, in the baroque times it has been renovated in 1731. Luckily only the parts that absolutely needed action were involved in the renovation, therefore, the medieval form of the church remained. The results of this renovation included the internal and the external decorative paintings, heightening of the nef, and the missing arches have been replaced, too. The first patron of the church was St. Catherine of Alexandria. After the renovation the church has been consecrated again, and the new saint patron was St. Magdalena. Then the church has been subject to renovations repeatedly: in 1860, in 1912, between 1964 and 1965, in 1990, 1991 and in 2015. There is an opened baroque door on the southern side. The arching of the tower has been renewed in the 18th century, and the quadrangular nef adjoins it. The only decorative element adding space to the interior of the church is the row of chambers in the northern wall. It is important to pay attention to the paintings on the wall of the church. These are not of medieval origin, but are the clear evidence of the architectural enrichment of the church. It reflects the due respect of the folk art treasure forms. Inside the building there are the fragments of a baptising pool from the Roman age, and a consecrated cross from the medieval age. The church of Egregy is one of the three churches from the Arpadian age left entire in the area of Lake Balaton. The structure and the space of the orientated church are clear-cut, it has a straight sanctuary and a single nef. The tower has three floors of rich formation, with double and triple windows. The tower is covered by an octagonal helmet-shaped roof reinforced by eight quarter-timbers. The foundations preserved the forms used for building from wood. The painted decorations and the scratched forms remained on the external surfaces. The Heart of Jesus church is located in the Egregy part of the town. It consists of two parts constructed in different ages. Close to the church there are building ruins left from the Roman age, the excavation was brought to a close in 2004. The church was built based on the plans of Janos Bocskai architect. The belfry was built at the beginning of the 20th century, while the nef was completed in 1994-1995. The belfry built in 1905 had two floors, but in 1937 a third floor was added. The tower built in Roman style has twin windows and includes a small and a large bell. The small bell has been founded to do homage to Maria Magdalena in 1905. In 1937 the large bell was founded upon the order of Egregy village to do homage to those who died in the King’s service. To pay homage to those 16 people lost in World War I there is a table made of stone in the middle of the cope and the names are listed on this. In commemoration of them again there were 16 trees planted, together with grave-markers having each name, date of birth and birth of death carved into those. There are only 6 trees alive as of today. To pay homage also to those who died in World War II there was a memorial tablet placed into the wall of the belfry, including the names of the young people from Egregy who died. Later the tablet has been moved to the graveyard. In 1994 the construction of the church nef started in accordance with the plans of Janos Bocskai. Then it has been consecrated by Dr. Gaspar Ladocsi major-general, chaplain general to the forces on April 22nd, 1995. The church is also called Fradi church, due the significant support provided by Sport Club of Ferencvaros (Fradi) for the construction. The white and green colours of the interior and the small memorial corner reflect the ties with the club. The Holy Spirit Catholic Church is the largest church of Hévíz. Its seating capacity is about 1000. The foundation stone of the church was laid by Jozsef Szendi then bishop in May 1996. Its GPS co-ordinates are the following: N 46° 47' 21.85", E 17° 11' 06.04"
The church was built based on the plans of Janos Bocskai architect. Due to the support of the town and the population it has been completed in three years. The seven sky-high towers serve as a guide for the visitors of the town. The seven towers are the symbols of the seven gifts of the Holy Spirit. On September 9th, 1999 it has been consecrated together with the Town Hall by Jozsef Szendi retired bishop. The interior of the church is alloying modern architecture and tradition enhanced mainly by the nice wooden panels. Its excellent acoustics makes it a suitable scene for giving organ concerts, too. The colourful windows with their Gothic-like forms are the hand-made products of Endre Simon artist from Heviz. The torso cross on the wall of the sanctuary is a 200 years old art treasure that has been granted to the church and has been restored by Gyula Karolyi restorer and painter. The bronze statue of Christ on the left side of the altar was created by Laszlo Marton. He is also the composer of the bronze statue called the Dowager of the Hungarians standing on the right side and wearing the Hungarian Crown. The lustre glaze pictures on the walls were made by Laszlo Morvay. The wooden structure was built by Tibor Kováts and the wooden works of the interior were produced by Andras Hegedus. There are four bells in the towers. In the garden of the church and in its neighbourhood there are several statues and reliefs. Due to static reasons there was no bell placed in the highest tower. In the tower on the left there are two bells ringing, one of those have been founded by Dr. Bela Horvath and his family to pay homage to Saint Peter, the another was moved here from the old church. One of the bells in the right tower have been founded to do homage to Saint Paul and the costs were covered by the widow of Imre Varga, its another bell is again from the old church. The Calvinist church was constructed between 1995 and 1998 based on the 1941 plans of Balint Szeghalmy architect from Nagyvarad. The marble decorations of the building are evocating of the Hungarian Calvinist churches of Transylvania. When creating the interior the Calvinist traditions were followed and it has remarkable woodworks. The church is used both by the Calvinist and the Lutheran denominations for servicing and meetings. Indeed only the minority of the population of the town is Calvinist or evangelical, but every year there are thousands of visitors belonging to these churches arrive here from Hungary and from abroad. The Calvinist from Heviz used to have no church, their meetings were held in houses and in the Community Centre of the Spa-Hospital. The evangelists used the small room of the movie theatre, then the lobby of Hotel Alba and the Community Centre of the hospital. In 1994 the city council made a donation of this piece of land to the denominations. It was again the local government supporting the construction, then a funding was started in order to cover the remaining costs of the works started in 1995. The foundation stone of the Calvinist church was laid on June 21st, 1997. The finished church building was consecrated by Dr. Bela Harmati evangelist bishop and Dr. Mihaly Markus Calvinist bishop. Karoly Borsos and his family made the donation of the bell located under the opened arch of the tower to the church. The official name of Hévíz Art Cinema is Fontana Filmszínház (Fontana Motion Picture Theatre). The Motion Picture Theatre has a projection room for 130 people, which was renovated in 2015. Recently new digital technology equipment has been installed ensuring up-to-date video and sound quality. In Hévíz you can find recreation facilities not only for your body but for your mental condition as well. In the course of a nice afternoon walk it is worth visiting the Hévíz Museum Collection, which can find above the Fontana Cinema in the walking street. The permanent exhibition allows visitors to get insight into the 210-year past of Hévíz in the room of the local history. Visitors can also see the memorial room named after dr. Károly Moll, which was set up in commemoration of the famous doctors from Hévíz. In the Museum there are also some temporary exhibitions to be visited apart from the permanent one. The Museum’s permanent exhibitions are “History of Hévíz”, “Memories from Hévíz Spa”, ”Medical History Memorial Room for Senior dr. Károly Moll” and “Exhibitions of artist József Simon”. The outside front of the building is decorated with the work named “Spring” by Munkácsy Prize awarded ceramic artist János Németh. The Museum is open for visitors between 10 a.m. and 6 p.m. from Tuesday to Saturday. There are no admission fees. THE WORLD’S UNIQUE – Balneology and local history exhibition – During the MUNKÁCSY exhibition it cannot be visited independently! It can only be viewed with the ticket purchased for the MUNKÁCSY exhibition! The museum will be closed between 8th January 2018 till 21st January 2018. If you come to Héviz for a fairly long time and you also consider cultural programs important during a medicinal cure, the Zsigmond Móricz Town Library might be interesting for you; you can borrow books both in Hungarian and foreign languages there. Beside the Museum you can also find temporary exhibitions on several other spots of the town, for instance, in the Gallery of the Fine Arts of the Aquamarine Hotel there are exhibitions regularly, where tourists can meet artists in person at the opening of the exhibitions or in the Show Room of the Magyar Csárda Restaurant being in service for more than 15 years, and major hotels also organize exhibitions of fine arts on temporary basis. The exhibitions may be visited free of charge. And once the Fontana Motion Picture Theatre has been mentioned, we recommend the cinema as an entertaining evening program for young visitors. Having a cinema is quite unusual in the area, as there is no cinema even in Keszthely. The cinema has a seating capacity of 104 persons. Recently new digital technology equipment has been installed; as a result, both the video and the sound technique meet the most modern requirements. However, we should warn visitors not to expect the standard of multiplex cinemas but they should imagine a nice cinema typical of small towns. Have fun and enjoy mental recreation. The buildings located next to the main car park in Széchenyi Street are called „the row of cafeterias”. If you approach Hévíz from the direction of Lake Balaton, turn right at the first crossing to Széchenyi Street, and after passing the forest belt you can already see the cafeterias. If you fancy a tasty “lángos” (fried dough) or a grilled sausage, here you can find what you are looking for from the wide choice of delicacies offered by the best buffets. If you prefer a traditional dinner or lunch, don’t hesitate to treat yourself in one of the many restaurants of town. You can purchase Hévíz gifts and the must have swimming aid during your holiday at the gift shops located in between the cafeterias. Life music and entertainment programmes are also offered to the tourists in the evenings. 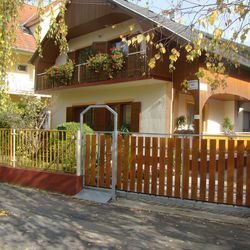 The Egregy part of Hévíz town is famous for its gastronomic delicacies. From downtown you can access the wine cellars in 25 minutes on foot. On your way you will pass Jesus’ Heart Church (Jézus szíve templom) at the end of Zrínyi Street or you can visit the Roman excavation site at the end of Attila Street. In the evenings the wine cellars and restaurants built in between the rows of vines are magnets for the guests of the town. This is a great place for the guests - exhausted after bathing – to charge up with a nice dinner or enjoy a wine tasting event while listening to live music. Restaurants offer not only traditional Hungarian specialties, but also international dishes on their open air terraces or in the cosy wine cellars. If you carry on down Dombföldi Street among the wine cellars, you can reach the Arpadian Age Church, which is one the most beautiful built cultural heritage of Hévíz. The artefacts of the permanent exhibition in the newly established museum of Egregy, operating since October 2015, cover a wide time interval: the exhibition starts from 6,000 BC and ends with the Middle Ages. The first of the thirteen exhibition cases presents the New Stone Age, because it can be archeologically recorded that the first settlers appeared in Egregy then, i.e. in the 6th millennia before Christ. This is demonstrated by the excavated stone tools, pottery fragments. Making a few steps, in front of the findings of the Bronze Age, the Early, the Middle and the Late Iron Age – potteries, urns, jewelleries and body stamps – you step over to the Roman Ages, to which five display cases bear witness. The coins unearthed from the mud of Hévíz Lake prove: the Romans used the lake not only for industrial purposes, but also as a health resort as far back as two thousand years ago. You can also get acquainted with the Roman architecture, the building materials used, and you can also find altar stones here. In a separate room, those who are interested can view the reconstructed images of Roman villas, including the picture of the Villa Rustica situated next to the museum. In the Roman period, buildings of this kind were typically given to veteran soldiers as a noble gift. In the ground plan of the building in Egregy, you can observe the pillars of a Roman hot water bath and also a Mithras altar from a later era. Mosaic pieces, glass window fragments, two copper figurines and a tiny roe deer figurine, which is unique in its kind, tell about the past in the exhibition cases. Some experts believe: it was the plaything of a patrician’s child living in the villa rustica and it was cast in bronze on the basis of a model in the late imperial era. Others say that the roe deer was a totem animal placed in a tomb. Belt buckles, ornaments and potteries bear witness to the Migration Period, and also the skeleton of a witch from the 9th century survived. One of the unique phenomena of the settlement excavated in the Hévíz Hill is a 23-30 years old woman buried in a house, of whom the community of the village was certainly afraid. The objects placed around her – such as a jar for storing “magic herbs” and an incense – can refer to her particular profession, and to the fact that the community regarded her as a witch. It is proven by the fact that after the body was placed in an unusual posture – both arms were bent to her shoulders, her legs slightly astride, in frog position - on the ground, the house was demolished and covered in soil. The experts presume: the woman was the victim of practises against vampirism. The museum of Egregy is open from 8.00 am to 6.00 pm from Monday to Saturday. The tomb of the Roman soldier, or the late Roman brick-tomb is located in the Egregy part of Heviz. The tomb was made out of bricks with quicklime.It has been discovered in 1925 when doing earthworks and it was fully intact. The objects found in the tomb were from the era of the Roman imperator Constantinus II. Bronze belt decoration, cloth clamps, knife made of iron, coins of the imperator and of course the skeleton of a Roman soldier were found. The findings were placed in the Balaton Museum located in Keszthely, and the skeleton was left on its place. In 1931 the ruins of a Roman cottage of the early Augustan age were discovered a few hundred meters to the East of the tomb, in the neighbourhood of the Villa Rustica excavated between 2001 and 2004. The house was built at the end of the 1st century. The findigs suggest that the building must have been richly decorated and it was still in use in the 4th century. When digging in the backyard of one of the houses of Egregyi Street a brick burning kiln was found. The items discovered in the neighbouring area testify that man of means have been staying here long time ago. For example on the way to the church to the Arpadian age there was a clay pot found, and there were 276 pieces of Roman coins from the 4th century in it. Even the ancient Romans discovered and used the lake of Hévíz. This is shown by the roman ruin garden located at the end of Attila Street, which was completely renovated in 2011. The remains of the roman villa from the early Imperial times were discovered in 1931 and then the building of Villa Rustica was excavated between 2001 and 2003 in its vicinity. The house was built at the end of the 1st century. According to the findings it must have been a richly decorated building and it was used even in the 4th century. At the turn of the 1st and 2nd centuries a large stone building was erected in its place which was 45 meters long and almost 23 meters wide, therefore more than 1000 square meters. The building had a porticus (columned porch) on the eastern side and some pools with warm, lukewarm and cold water. But it is not certain whether the building was the residential building (villa urbana) of the villa-farm, since there was no evidence of central heating. The building is believed to have been ruined towards the end of the 2nd century, but in the 3rd century it was rebuilt with other interior design. Even a Mithras shrine was built in. The foundation stone of the altar was discovered during the excavation. The shrine and the building were destroyed in the 4th century, but soon it was rebuilt. At the beginning of the 5th century it was ruined completely. The function of the building is uncertain also in this period. Probably it was used for some kind of economic activity. Hundreds of wishes written on ribbons make the Roman ruin garden, located at the Museum of Egregy at the end of Attila Street, decorated. Placing colourful ribbons revive a Roman legend. The most well-known Hévíz legend about the formation of the lake and its miraculous effect is linked to the Roman Emperor Flavius Theodosius. According to the legend, Flavius suffered from infantile paralysis. Every day, his Christian nurse prayed to Virgin Mary asking for the boy’s recovery. Virgin Mary answered her prayers and brought forth water. A whole lake was formed from the thermal spring. The nurse bathed the ill child in the water of the lake regularly. Miraculously, Flavius got over his illness by the help of the water and became a strong, healthy ruler, the emperor of the Roman Empire. Out of gratitude, he declared Christianity the official religion throughout the realm in 391. The legendary curative lake is none other than Lake Hévíz, in the water of which thousands of patients have been healed and have regained the pleasure of healthy movement since then. Flavius wish ribbons can be purchased in the Webshop, in the Museum of Egregy and in the Tourinform Office in Hévíz at a price of HUF 200. Evoking the old times, the area behind the large car park is getting full of vendors on Tuesdays, Thursdays and Saturdays. Occasionally visitors can meet the products of honey producers, pickles and juice makers, cheese and vegetable vendors accompanied by traditional Transylvanian music. Fresh bread, sausages, home-made cakes and cow milk can be even tasted before purchasing them. Beside the fine goods, craftsmen sell their wares. Pottery, baskets or even hand-made soaps can be bought on the spot. The farmers’ market of Hévíz offers high-quality and chemical-free products for the conscious customers. Shopping here will not only support the local farmers, but it is a decision for healthy living. The 800 vendors, who offer their product for sale from time to time, have already decided for the Farmers’ market of Hévíz. Visit us, come and see for yourself! The main entrance of the lake is guarded by two cherubs, which were made on behalf of the Festetics family at the turn of the 19th and 20th century and they are very similar to the Zsolnay family’s cherubs in Pécs. The dragon made of a lion and an eagle can also be found on Hévíz’s official coat of arms. The cherubs served the gods in the mythology of the ancient Semite folks. They stood in front of the gates and kept away the demons. Their images were engraved in the stones of kings’ palace gates or church gates, most likely that is why the Festetics family had them made as well. According to the legend, if someone walks through between two cherubs without love in the heart, the cherubs start speaking. According to another storyteller not the cherubs but the copper rooster placed on one of the towers of the baths starts speaking, if someone leaves the town without love. But there has never been a precedent for this.